The Bravery stat is a measure of how brave a unit is in the face of danger. A higher bravery score reduces the amount of Morale lost due to morale-decreasing events, so a brave unit (alien or X-COM) has less likelihood of panicking or going berserk during combat. New X-COM recruits will always begin with a value between 10 and 60. Due to the way the Bravery stat is stored in the data files, it will always be an exact multiple of 10. X-COM soldiers' Bravery is capped at 100, although tanks and certain alien races can have a Bravery of 110. Unlike other stats, Bravery cannot overflow its cap because it can only increase by one unit (10 points) at most per combat mission. 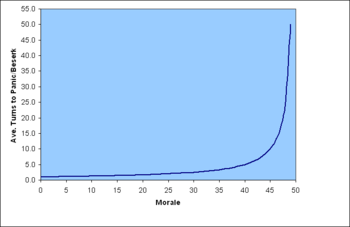 When a unit's Morale drops below 50, it has a chance of panicking or going berserk (see Morale#Panicking_and_Berserking for full details). If a unit successfully resists panicking, it will gain a "Bravery experience point". For each Bravery experience point gained during a combat, a unit will have an additional ~9% chance of gaining 10 Bravery at the end of the mission, up to a possible 100% chance with 11 or more Bravery experience points. (For supporting data, see Discussion.) Thus, if you keep an eye on your Morale, you can tell exactly how many Bravery experience points you have received - Every turn that Morale is below 50 and you don't panic/berserk, you get another point. The chance of getting an experience point (EP) is much higher, just below Morale 50. But even if your soldier's Morale is well below 50, their Morale increases by 15 each time they panic/berserk, so it will cycle closer to 50 over time... IF they don't keep getting Psi-panicked continuously (see Training, below). This means that, on average, it takes 14.93 turns to go from Morale 0 to 60 (the four asterisked points above, added together). Because four of those turns are spent in Panic/Berserk itself, there are 10.93 turns for which you'll get a Bravery experience point. But that's just the average... your soldier might Panic four times in a row (equals no experience) or may take many dozens of turns sitting at Morale 45. Your soldiers' Bravery can be trained easily and safely once you have completely secured a mission field, particularly after your troops have received Psionics training. Capture (i.e., Mind Control) one or more psi-enabled aliens (Ethereals or Sectoid Leaders/Commanders) and box them into a corner (or the Avenger) so you can shoot them later. Fully disarm the aliens using the inventory trick, and have all your soldiers drop all their weapons and grenades as well so they don't kill each other. Now you can hit the End Turn button repeatedly while the aliens go to work on your psi-weaklings. Soldiers with a Psi Strength of 80+ seem to be immune to psi attacks on the easier settings (you need 133 Psi Defence to be immune to Ethereal Commanders' Psi Attacks) (use them to wall the aliens in), but all others can be trained. In addition to possible Bravery gains, bravery training can also trigger secondary stat increases. See Experience for more details. Move any soldiers that have been psi-attacked repeatedly as far away from the aliens as possible to give less psi-weak soldiers a chance to get trained. Aliens will favor attacking psi-weak soldiers, but also focus on nearby soldiers. They also cannot mind-control soldiers past a certain distance, so move your weakest soldiers to a distance where they can only be panicked, not controlled. You may need to mind-control the aliens periodically in order to regain control of your troops so as to move them away. Alternatively, you might stun your psi wimps while they're mind controlled, to remove them from the picture. This has no effect on score, etc. (Just make sure their bodies are safe from explosions!) But be careful that you don't leave yourself with so few soldiers that all your conscious ones might get MCed... if at any point all your men are MCed or unconscious, Game Over! The table above states it takes an average of 14.93 turns to go from Morale 0 to 60. Minus the four turns spent Panicking, this is 10.93 turns you'll get a Bravery Experience point (11 are needed for a guaranteed Bravery increase). In-game testing found somewhat similar results. The Bravery Counter (which doesn't count the turns spent Panicking) showed these stats for Morale to go from 0 to 60: Minimum 0, median 8.5, average 12.9 ± 13.0, maximum 67 (N of 104 soldiers). A few soldiers took a very long time to go from Morale 45 to Morale 60. This is only expected when there's only a 10% chance, but it did cause the average to be considerably higher than the median. In any event, remember there have to be at least 12 turns below Morale 60 for a soldier to get 11 Bravery counts, and more like 14 (11 for increases, plus 1-3 Panics). This won't happen if your soldiers keep getting Panicked by aliens... they'll hover near 0 Morale, Panic every turn, and you don't get any experience. They also won't get 11 experience if they recover to Morale 60 quickly. If you're serious about Bravery training, play with the distances from your soldiers to the target alien(s). For psi-unlocked troops, it's pretty easy to figure out each soldier's psi distance to the alien. ANOTHER METHOD, which does not rely on psi-capable aliens, is to MC several aliens... then get an X-com soldier to shoot them to death while still under X-com control. Note: Of course, if you are so psi-forces are so powerful that they can actually set up this scenario... you don't NEED to perform any more bravery training, since you would almost never lose morale in the first place. Unlike all the other stats, bravery's usefulness is inversely proportional to how powerful your troops are compared to the enemy. In addition, the bravery experience sytem has an important difference from other stats... it's like the Opposite of reaction gains, in that sense. For Reactions, your troops with low reactions will tend to never make reaction shots, and thus will never improve, whereas your ninjas will improve fairly quickly. For bravery, it is the only stat where a low starting score makes it more likely to improve. In fact, Bravery tends to be a self correcting weakness. Either your soldier will naturally improve, or he will die, thus ending his plague upon your squad. In that sense, the best form of bravery training is just to fight normally, and let bravery rise by itself. Try bringing one high ranker, and little or no other officers, for this technique. Normally your highest officer mitigates morale loss (but causes a steep drop if s/he dies) - so reversing this (zombifying your Commander) will mean the least number of "rounds" and score loss. Don't worry, you'll get your Commander back... probably! Psionic panicking attacks will reduce a target's morale by (110-Bravery) each time. Although high Bravery will not make a unit more psi-resistant, particularly to mind control, it can greatly reduce the impact of panicking attacks performed on that unit. See Morale#Psionic Panicking Attacks for full details.